Hastings resident Kenneth L. “Ken” Bohlen, 84, passed away Friday, April 5, 2019, at Mary Lanning Healthcare, Hastings, NE. Services are 10:30 a.m. Tuesday, April 9, at St. Paul’s Lutheran Church, West of Glenvil, with Pastor Greg Gabriel officiating. Burial with military rites by the Hastings Military Honor Guard will be in St. Paul’s Lutheran Churchyard Cemetery. Visitation will be 1-8 p.m. Monday with the family present from 6-8 p.m. at the funeral home, and one hour prior to service at the church. Memorials to St. Paul’s Lutheran Church, Glenvil or Mary Lanning Hospice. Ken was born February 2, 1935, to George & Helen (Janssen) Bohlen in Glenvil, NE. He graduated in 1952 from Hastings High School. Ken served in the army from November 9, 1954 thru October 19, 1956. He was stationed in Mannheim, Germany. Ken was a life long farmer and belonged to many co-op boards. He served his community as a school board member for 40 years in the county grade schools and was on the Adams Central board where he was instrumental on the building of the school. Ken was an NRD Board member. He received the award for Outstanding Young Farmer of the Year. 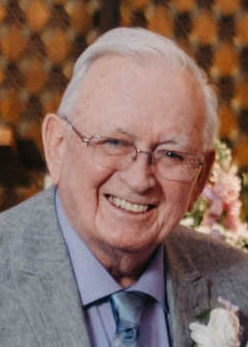 He was a member of the Farm Bureau and State and National Wheat board and served as president of the local Farm Bureau chapter for many years. In 1966 he received the Outstanding Young Man of the year award. In January 22, 1955, Ken married Barbara Jean Hegwood at St. Paul’s Lutheran Church west of Glenvil, NE. Ken and Barb were life long members there as Ken served as a church council member for many years. To this union were born 5 children; Christine, David, Shelly, Janice and Barry. Ken was proud of his children and interacted with them. The greatest sorrow was losing son, David, at the age of 18. Now he will be united with him. Ken & Barb spent a lot of time traveling with many friends and family. Ken was always talking about the next place to go. He loved to go to coffee with his friends every morning, playing cards and going to casinos. Ken was a loving father of 5, grandfather of 14, and a great-grandfather to 6 and was so proud of them all. He loved going to the kids’ basketball games and other events. Ken was preceded in death by his parents and his son, David.